You can always create a report in an RTF format for Word, which will display your compiled summaries together with the corresponding coded segments in a table overview. Click on the Summaries with Coded Segments symbol in the Reports tab and select the menu option Summaries with Coded Segments. A dialog window will appear with several options. Only for activated documents – only summaries from activated documents are included. Only for activated codes – only summaries for activated codes are included. Include comments – under the coded segments, the corresponding comments (if any) are also included. Standardize text formatting – given that coded segments can be formatted very differently, you can use this option to standardize the font format. Click OK and enter a name and location for the report. MAXQDA opens the exported document immediately. 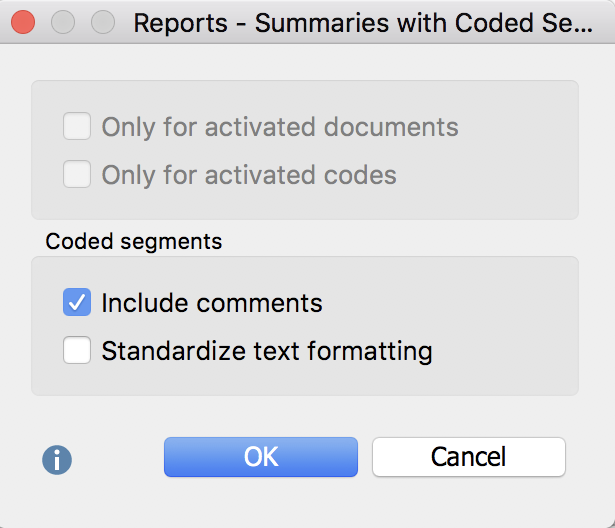 For each selected code, your report will display the coded segments of the selected documents in one column and the summaries in another column. 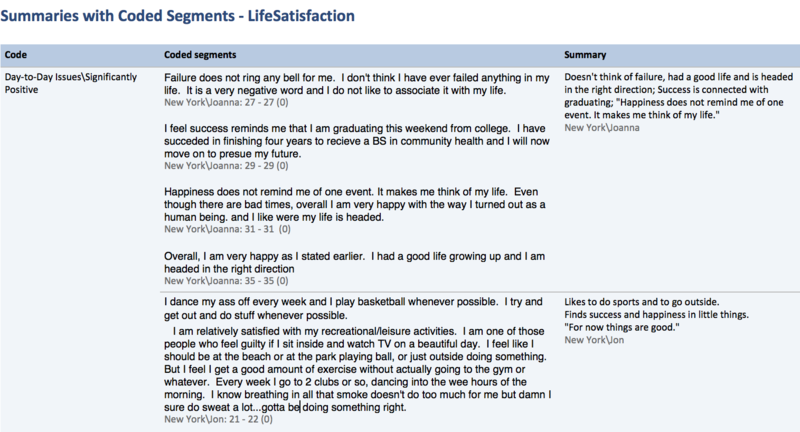 You can use this examine these summaries and review each of them with reference to their underlying coded segment. The report presents your summaries in a transparent and comprehensible way. You can also create reports that only present your summaries: Reports > Summaries with coded segments > Summaries. The “Coded segments“ column is not displayed – only the codes and their respective summaries.